The summer Milky Way sets over Grand Canyon National Park. Photo by the U.S. National Park Service. The International Dark-Sky Association and the National Park Service are excited to announce that Grand Canyon National Park is now a Provisional IDA International Dark Sky Park. 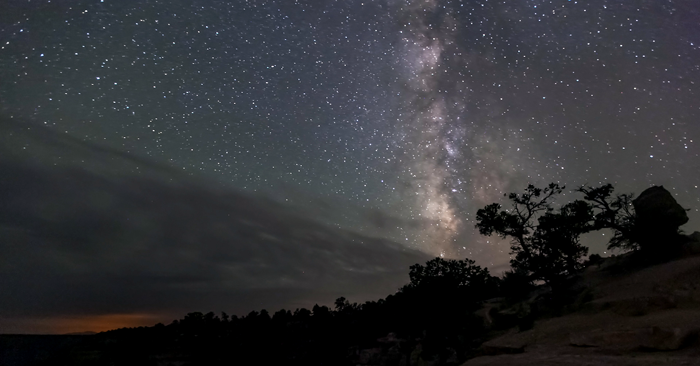 “The designation of Grand Canyon National Park as an International Dark Sky Park is an important step in ensuring the Colorado Plateau remains a protective harbor for some of the best night skies in the country,” said IDA Executive Director Scott Feierabend. IDA established the International Dark Sky Places conservation program in 2001 to encourage communities around the world to preserve and protect dark sites through responsible lighting policies and public education. Many of the best protected night skies in the country are found within national park boundaries. Grand Canyon joins eleven other national park sites certified by IDA. Including Grand Canyon, eight of the national park sites with IDA Dark Sky Park status are located on the Colorado Plateau. The NPS especially focuses on sustainable outdoor lighting because it combines technology, design, and practice in a way that allows parks to increase energy efficiency and enhance visitor experiences. Of all applications from across the globe, Grand Canyon’s is one of the most complex IDA has seen, and includes an inventory of thousands of light fixtures on both rims and in the inner canyon. Having “provisional” status gives Grand Canyon three years from the date of today’s announcement to retrofit two-thirds of the park’s lights to comply with IDA’s stringent lighting guidelines. At the time Grand Canyon submitted its application, about 43 percent of the park’s lights already met IDA criteria. Grand Canyon plans to complete the necessary lighting improvements to receive full IDA Dark Sky Park certification in 2019- the 100th anniversary of the national park. Grand Canyon Association (GCA), the park’s official not-for-profit sponsor, helps fund and sponsor events such as the ongoing Star Party, as well as park stewardship activities including the Night Sky Initiative. The Star Party will continue every night this week until June 11 on both the South and North rims. On the South Rim, stop by the Grand Canyon Visitor Center for slide shows, Constellation Tours, and free telescope viewing any time after dark. On the North Rim, astronomers will set up telescopes on the veranda of the Grand Canyon Lodge and offer slide shows in the lodge auditorium. In addition to the Star Party, rangers offer night sky walks and talks throughout the year. A natural night sky is a resource integral to overall ecosystem health. Over 60 percent of all known species are nocturnal and those that are diurnal need naturally dark environments to recover from daily activity. Grand Canyon’s night sky walks and talks–an important part of the application process and integral to receiving Dark Sky Park Status– provide visitors an opportunity to learn about this nationally significant resource and the continued efforts of the NPS, IDA, and GCA.